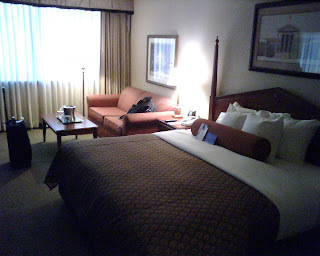 I recently stayed at the Hilton Perimeter Park in Birmingham for 1 night on business. The hotel grounds and property are very nice and well maintained. The staff was very friendly even though the room I confirmed on my reservation was not available, the front desk person found a suitable substitute, honestly though one of my biggest pet peeves with hotels is getting the reservation right. The room was very well maintained. The whole property is going through a renovation and I was trying to figure out if my room had been done or not because everything in the room was immaculate even thought it didn't look like one of the renovated rooms. 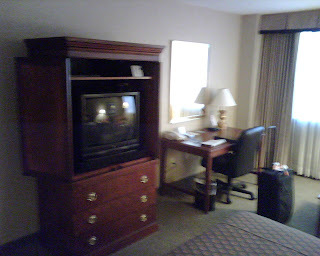 The room was very comfortable with a king bed, sofa and desk. Everything in the room functioned well including the A/C and WiFi which both performed flawlessly and two of things that are the most important to me. The bathroom was pretty much a standard hotel bathroom but very clean and with plenty of amenities. I didn't get a chance to actually use the fitness room as I was only here for one night, but looked in it and it seemed ok, not many machines but the ones that were there were in good order. There is also an outdoor pool. Overall, this hotel is what you would expect every Hilton you stay at to be like. For Birmingham, its probably one of the better full service hotels in the area. There are plenty of restaurants and shops nearby and its central to the suburban business district. I wouldnt have a problem returning here.